AUGUST 4, 2000 – FORT ERIE, ONTARIO: In an unprecedented move, the Vatican is forcing a Canadian Catholic priest to drop his libel suit against another cleric by illicitly threatening him with the rare and extraordinary punishment of excommunication. Father Nicholas Gruner, who heads the Fort Erie-based Fatima Center, has offered to withdraw his libel action against Monsignor Alan McCormack, now based in Cardinal Ratzinger’s Congregation in Rome, provided the unwarranted threat of excommunication is withdrawn together with certain guarantees. Father Gruner’s civil suit seeks a retraction of public statements made in 1990 by Msgr. McCormack, then an official of the Archdiocese of Toronto, challenging Father Gruner’s status as a Catholic priest. Excommunication, which formally severs all connections between an individual and the Catholic Church, is a punishment normally applied only to persons guilty of grave moral or theological offenses, such as the persistent preaching of heresy. Since this penalty effectively terminates a priest’s career, it is very rarely used. Hundreds of priests convicted in civil courts of serious sexual and financial crimes in recent decades have been spared this punishment, as have prominent theologians, such as Hans Kung, whose published views are notoriously contrary to Catholic teaching. Father Gruner has never been officially accused of any such offenses. In fact, Father Gruner has never been canonically accused of any offense whatsoever against the Catholic Faith, Catholic morals, or Canon Law. The excommunication threat was made in a letter (dated June 5, 2000, and delivered by two messengers to Fort Erie on June 21) from Dario Cardinal Hoyos, who heads the Vatican’s Congregation for the Clergy in Rome. Catholic moral theology and Canon Law allows Father Gruner to sue in civil court for libel if other avenues of defending his good name are exhausted. In any case, Canon Law does not provide for the penalty of excommunication for such a civil suit. Nevertheless, according to a Vatican official, the letter bluntly warned Father Gruner that failure to withdraw his libel suit “would provoke additional canonical procedures against him, up to and including the penalty of excommunication.” Since Father Gruner was attacked in print a decade ago by Monsignor McCormack, Father Gruner has made several unsuccessful attempts to reach an out-of-court settlement. The Toronto Archdiocese’s only response was an attempt to have the suit dismissed, claiming that the Church’s internal court was a more appropriate forum for resolving the matter. In view of the excommunication threat, Father Gruner has now requested a meeting and direct negotiations with Vatican officials, including Hoyos. At the same time, Father Gruner requested an adjournment of the libel trial in order to accommodate the requested meetings at the Vatican, which may take many weeks to arrange. Earlier this year, Justice Gloria Epstein of the Ontario Superior Court ruled that the case “can and should be resolved in this court,” since the Church’s internal dispute resolution process does not provide for the awarding of damages, and lacks a mechanism for enforcing such awards. 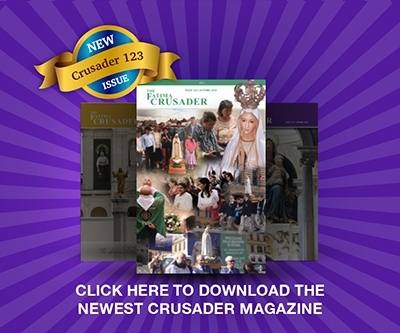 Father Gruner’s organization publishes a quarterly magazine, “The Fatima Crusader”, with over one million readers in Canada and the United States. It promotes traditional Catholic teachings and devotions, and has attracted strong opposition from Fatima skeptics in the Vatican bureaucracy. Notably, the same Cardinal Ratzinger (whose Vatican office employs McCormack) mentioned Father Gruner by name in his press conference of June 26 regarding the Third Secret, and suggested that Father Gruner was in a state of anxiety. “It must be because Cardinal Ratzinger knew of Cardinal Hoyos’ threat of excommunication. I am not now suffering, nor was I suffering on June 26, from any state of anxiety. The excommunication threat has no basis in Church law and my mind is at peace. I don’t know what else Cardinal Ratzinger could be referring to. His choice of the word ‘anxiety’ is surely no coincidence,” said Father Gruner. Since both European and North American press have sought the benefit of Father Gruner’s and the “Fatima Center’s” extensive research on the Third Secret, it may be that there is more to this excommunication threat than meets the eye. It appears that this is an attempt to silence the “Fatima Center” from revealing to the world all it knows about the Third Secret independent of the Vatican and, in particular, the news that clearly contradicts the Vatican “spin” on the Third Secret. The suit is currently scheduled for trial on August 28, 2000 in Toronto, Canada.